Liz Navarro is an educator and communications professional. Before she moved her public speaking classroom to SMU, she taught speech at her alma mater, Pepperdine University, and English in urban schools throughout Los Angeles. Liz’s own public speaking career began after an EPIC wedding toast that guests said (direct quote): “Should have made it to the Ellen Show.” It never even made it to YouTube. 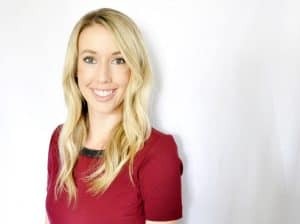 She practices as a communications marketer, strategic planner, consultant, and evaluator for Dallas-area nonprofits and brings advertising and marketing experience from bon appetit magazine, W magazine, and TOMS Shoes. Her love for teaching and for communications come together in the classroom, where she aims to provide the knowledge that will prepare students for their communications careers and the passion that will encourage them to love the field they chose. Liz came to Dallas by way of California (most recently) and Idaho (her home state). She lives here now with her 16-month-old daughter, Lucy, and her 366-month-old husband, Alex.